Studded Plate: The Regatta: An alternate scenario for "Pirate Dice"
The Regatta: An alternate scenario for "Pirate Dice"
Pirate Dice: Voyage on the Rolling Seas is a board game published by Gryphon Games. In the standard rules, the first ship to reach the "X" space on the Treasure Cove Map finds the treasure and wins the game. In the advanced game, you have to pick up the Treasure Token then carry it back to the "X" on the Starting Shoals Map--while everyone else tries to sink you and take it for themselves. I recently suggested a new scenario for my family, which I dubbed "The Regatta." Instead of finding treasure, you race around a larger map, using all six map boards instead of just three (Starting Shoals, Treasure Cove, and one other). The object is to complete a circuit of the board and return to the "X" on the Starting Shoals Map. 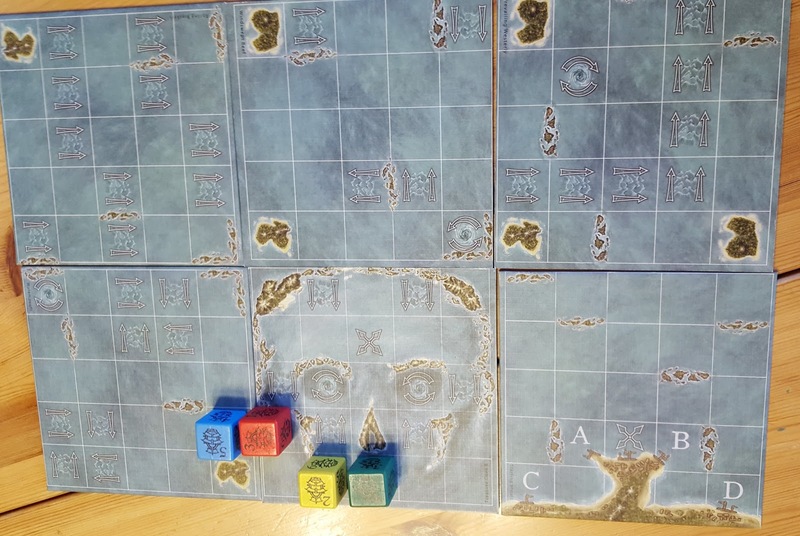 The Treasure Cove Map (the skull-like piece below) has one impassable side, which is placed in the center of the board to force the ships to pass through all six map sections. Place the Starting Shoals Map in one corner so that the lettered starting squares are on an edge; the ships must cross the opposite side to the next tile, then continue around the course back to that first tile. The photo above shows the map set-up for our first Regatta. The Treasure Cove Map forms a narrow strait that forces the ships into close proximity to each other. Next time, we will make sure that we don't have such a congested entry point into the Treasure Cove Map. In our first game, the island in the corner of the lower left tile forced everyone to cross a whirlpool (under the blue ship die), which caused a traffic jam between tiles. This resulted in the ships in the rear being stuck in place waiting for the leaders to move further ahead. By the time they were able to move ahead, the leader had won. Moving the Starting Shoals Map so that it isn't adjacent to the Treasure Cove Map will help with that. The leader going into "Skull Strait" will still have another tile to cross after it, which should give the other players more opportunities to catch up via moving closer and/or sinking their opponent. We're also considering requiring ships to tag the "X" on the Treasure Cove Map (ending a Bell on that square), so that ships can't just blow past that tile by hugging the edge. This change would make the Regatta more like the advanced game, just with a larger map--and also more like Robo-Rally, from which many of Pirate Dice's mechanics were derived. The main difference is that in the advanced game, once one pirate has picked up the treasure, you just need to sink them and end a Bell in the Treasure Token's new space to grab it for yourself. Do you have any optional scenarios or house rules that you use with this game? If so, I'd love to hear them! Please post in the comments below (or send me an email and I'll mention it in a future comment or blog post).